May 2012 – Amit Bahree's (useless?) insight! Metro Apps in C++ anyone? 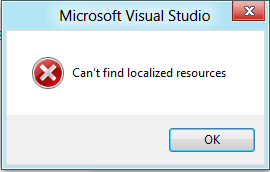 In Visual Studio “11” when I try and create a new C++ Metro app using the built-in template, I get the following error: “Can’t find localized resources”. I wonder if anyone else has managed to get around this? I am running the Consumer Preview Build of Win 8 (Build 8250). Posted on May 19, 2012 May 19, 2012 Categories .code, .microsoftTags .code, .microsoft, .ms.futureLeave a comment on Metro Apps in C++ anyone?